Whenever the occasion arises to entertain guests in their home, the party hosts will want to ensure that they accommodate their friends and family members in a warm and comfortable fashion. Whether the group size is two or twenty-plus, the same amount of time and effort will customarily be invested in preparing the home and developing the menu in anticipation of an enjoyable evening. The type of party is of course at the discretion of the hosts; it may be a drop-in open house, a theme party, a private reception, or perhaps a more formal sit-down meal; regardless of the style, the service of alcoholic and/or non-alcoholic beverages will most likely need to be considered in the preparation and planning of that party. And in many of these cases, the extent of such deliberations could focus solely on where to set up the beverage station; that is, what is the most convenient spot in the home for people to go to serve or pour a drink. If homeowners find themselves in this type of situation, perhaps to the point where it might actually limit their desire to entertain guests in their home, Carrocel fine furniture may have just the right solution – handy pieces of furniture known as bar carts. Clearly, bar carts can be extremely versatile pieces of furniture in any home, whether they are reserved for their intended purpose only or utilized as storage carts or in various other capacities at the discretion and creativity of the homeowner. To view the complete collection of high-end bar carts currently for sale in the Carrocel store, please see Bar Carts or visit their 20,000 square-foot showroom at 245 Bridgeland Avenue near the Yorkdale Mall in Toronto. 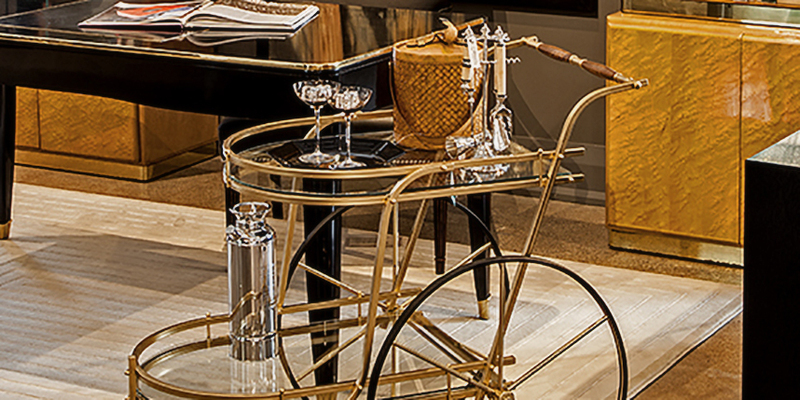 Accentuate and add versatility to your in-home entertaining with Carrocel’s bar carts. Call Carrocel today at 416-999-2525 or contact us to request a complimentary consultation.